UKPSC Haridwar has released the interview dates for Lecturer recruitment in Govt Polytechnic for Civil, IT, Electrical & Electronics . Earlier screening exam for Govt Polytechnic Lecturer was held on 27 Sept 2015 and result was published on 09 Feb 2016. Now candidates can check and download interview schedule for lecturer. The interview for lecturer recruitment in Govt Polytechnics will be held on 24 July to 28 July 2017. UKPSC Govt Polytechnic Lecturer exam was held for the post of Civil, IT, Electrical & Electronics lecturer. Qualified candidates can check interview schedule to the link given below. 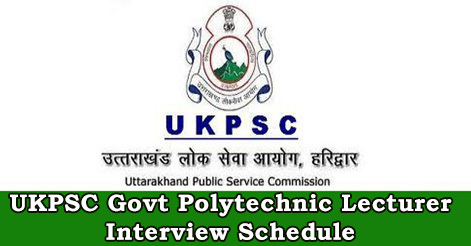 Help us to improve this article/job posting "UKPSC Govt Polytechnic Lecturer Interview Schedule". We would be glad if you can comment below and provide your valuable suggestions and feedback. If this page have any wrong information/list or out of context content, then you can report us as well. Sir/Mam I recently completed my B.tech from B.T.K.I.T ,with E.C.E branch.